USS Guam CB-2 at Pearl Harbor in February 1945. Note that the 12" (30.5 cm) guns are individually sleeved, the bow 5" (12.7 cm) mount is superfiring and that the port catapult is swung out underneath the aircraft crane. U.S. Naval Historical Center Photograph # NH 97130. This gun was a major improvement over the 12"/50 (30.5 cm) Mark 7 guns used on the USS Wyoming (BB-33) class and was of a simpler, lighter construction. Designed to fire the new "super-heavy" AP projectiles, their side belt armor penetration at 20,000 to 30,000 yards (18,290 to 27,430 m) was almost identical to and the deck plate penetration better than the larger 14"/50 (35.6 cm) guns used on U.S. pre-treaty battleships. The manufacturing of these guns shows the changes brought about by the massive production increases caused by World War II. 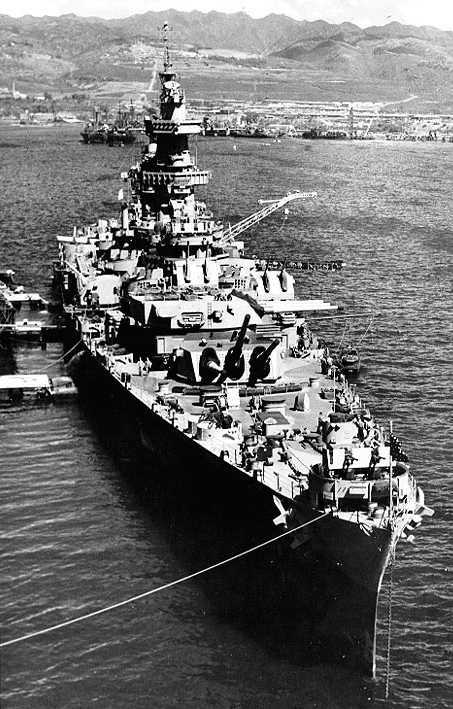 While the 16"/45 (40.6 cm) guns and turrets for the battleship North Carolina and her sister were made almost entirely at the Naval Gun Factory in Washington D.C., the rapid acceleration in shipbuilding during the war forced the Navy to move much of the production of heavy guns to other manufacturers. As a result, the forgings for the 12"/50 (30.5 cm) Mark 8 guns were made by Midvale and Bethlehem Steel Corporations and then sent to the Naval Gun Factory for processing. The Watervliet Arsenal also worked on the guns until they were approximately 65 percent complete and then sent them back to the Naval Gun Factory where the guns were finished. The turrets for these ships were built at the Naval Gun Factory. Constructed of liner, jacket, three hoops, two locking rings and a screw box liner. The bore was chromium plated. Used a down-swinging hydraulically operated Welin breech. The first prototype gun was completed in January 1942. ^AP projectiles had the windshield threaded to the AP cap and held in place by five equally spaced notches which were staked. The AP cap weighed 110.98 lbs. (50.3 kg) and was soldered to the nose. In addition to the solder, the cap was also secured with seven crimp caps equally spaced around the periphery of the nose. ^HC projectile bodies could be used with Point Detonating (PD) or Mechanical Time (MT) fuzes. When used with PD fuzes, they were considered to be HC rounds. When used with MT fuzes, they were considered to be AAC rounds. MT fuzes were probably set by hand on the loading trays. There was also HC Mark 22, which was the same as HC Mark 16 but apparently produced by a different manufacturer. ^Propellant was in four bags. Bourrelet diameter was 11.977 inches (30.4 cm). The above information is from "Battleships: United States Battleships 1935-1992" by Garzke and Dulin and is based upon the USN Empirical Formula for Armor Penetration. These values are in substantial agreement with armor penetration curves published in 1942. ^Although similar to the triple 16 inch (40.6 cm) turrets built for battleships, this mount had several features not found on other USN large-caliber guns of the 1930s and 1940s. It had a two-stage powder hoist vs. a single stage in the 16" (40.6 cm) mounts of the battleships. This change increased the rate of fire and provided a greater degree of safety. A unique feature was the provision of a projectile rammer to transfer projectiles from the projectile storage room onto the rotating ring. However, this feature was not entirely satisfactory and it was omitted from the Hawaii and removed from the upper projectile flats on the Alaska and Guam. ^These mounts had numerous problems, mainly because they had been rushed into design and construction without being properly tested. BuOrd noted that "this turret is an outstanding example of a case where prior testing of a new design by the manufacture of a pilot model was required." It appears that these problems were satisfactorily resolved in service, as former crewmembers have informed me that there were no major problems during their war-cruises. ^Turrets were electrically powered through hydraulic gear. Training motor was 150 hp and each gun had a 35 hp motor for elevation and a 40 hp ramming motor. The shells were stowed vertically on two decks and transferred to shell rings similar to the ones used on the 16" (40.6 cm) battleships. These rings were driven by 40 hp motors. Shells were carried by pusher hoists powered by 50 hp motors. Charges were transferred by ram type hoists, 35 hp lower hoist and 25 hp upper hoist. Turret II had a third 40 hp shell ring at the base of the turret which supplied axial lower hoists driven from two 50 hp motors. The gun axes were about 98 in (249 cm) apart. Ten gun turrets including one intended as a spare were built during the war. 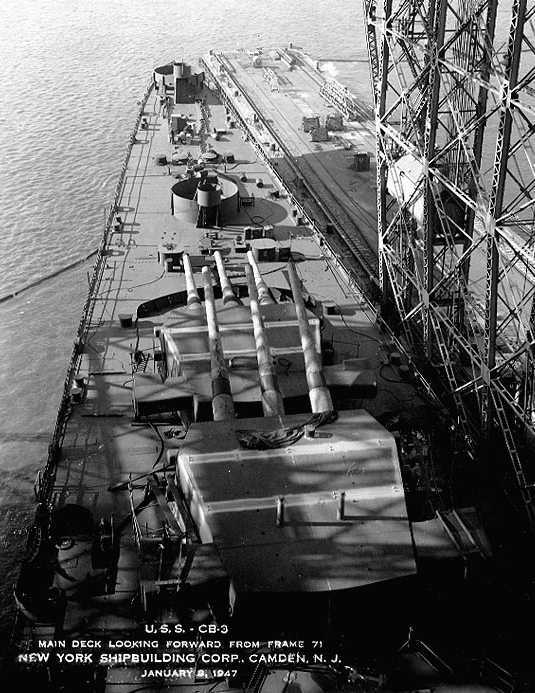 These turrets cost about $1,550,000 each, not including the cost of the guns themselves, making them the USN's most expensive gun mounting of World War II. Bow of unfinished USS Hawaii CB-3 in January 1947. Note the periscopes on Turret II. U.S. Naval Historical Center Photograph # NH 93586. 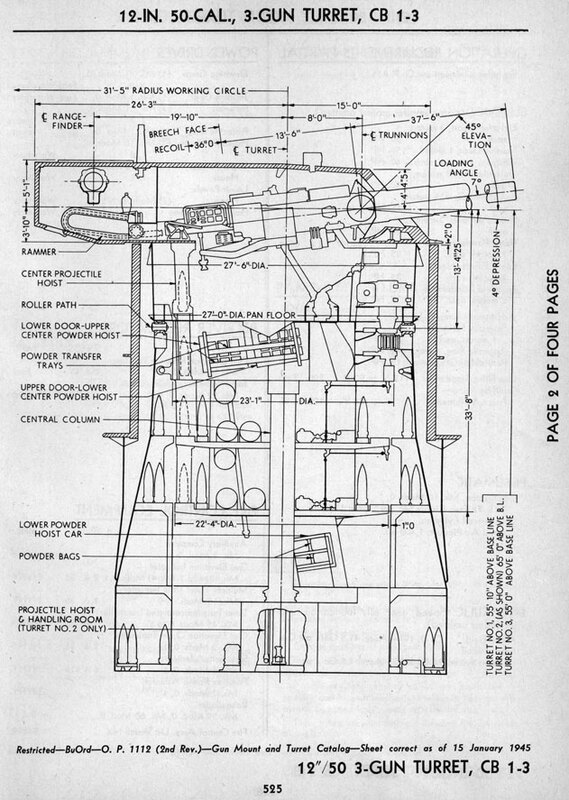 Alaska (CB-1) class Turret sketch from OP-1112. Image courtesy of HNSA.